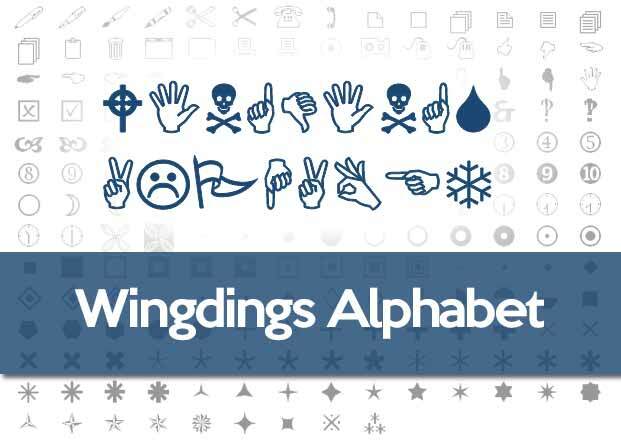 Wingdings is a typographic font created by designers Kris Holmes and Charles Bigelow for Microsoft in 1990 under the official name of Lucida Icons, Arrows, and Stars. 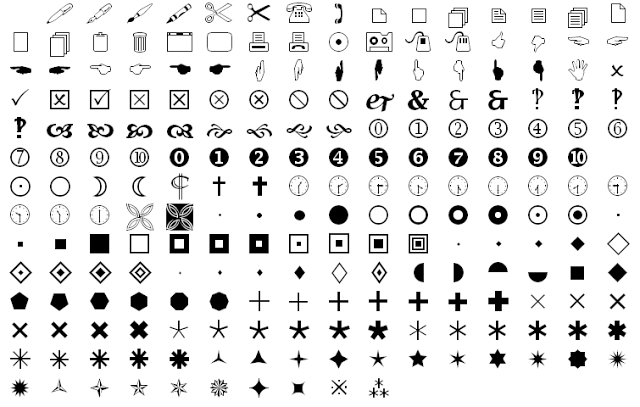 Renowned Wingdings in 1992, it was distributed in the TrueType format in all editions of the Windows operating system from version 3.1. 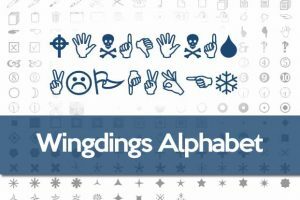 Instead of the traditional alphanumeric characters, Wingdings displays groups of graphic signs such as arrows, emoticons, pictograms, geometric shapes, religious and zodiac symbols, and typographic ornaments. The family was later expanded with two new versions, Wingding 2 and Wingdings 3, which provided a wider range of symbols and icons. It includes graphics of all types, from computer software such as folders, files, mail, printer or mouse, to religion, astrology, interface, ornaments, etc. 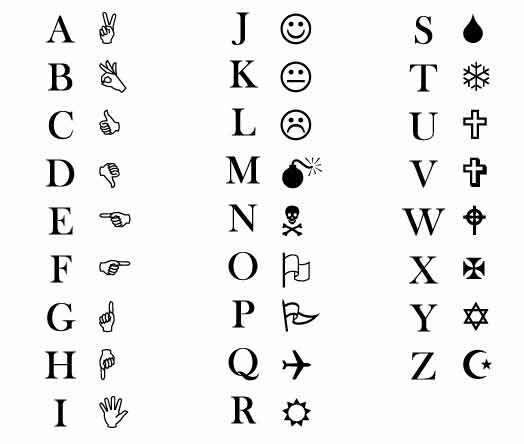 One of Wingdings’ most prominent controversies was the discovery, days after it came to light with Windows 3.1, that the sequence of characters “NYC” corresponded to the symbols of a skull, star of David and a hand with a thumbs up gesture. This was interpreted by some as approving the killing of Jews in New York. Microsoft flatly denied the intentionality of this by insisting that the symbols had been randomly ordered. Later, with the launch of another typeface of symbols, the Webdings, the characters “NYC” would correspond to an eye, a heart and the silhouette of a city, which could be interpreted as “I love New York”, and that Microsoft would confirm Which this time was intentional. There is also an urban legend related to the attacks on the Twin Towers of September 11, 2001. 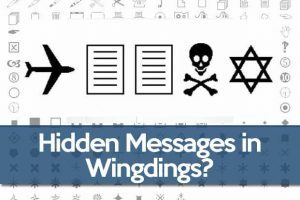 This legend says that if you write the sequence “Q33NY” in Wingdings, the letter “Q” becomes an airplane, the three are two pages Of documents but also resemble two buildings and the “N” and “Y” in a skull and star of David. The resulting graph shows how a plane will hit the World Trade Center with a message of death to the Jews. The acronym “Q33” supposedly was the designation of one of the airplanes. Anyway, this theory is not valid because the attack was not directed specifically to the Jews and none of the aircraft used that day had the denomination “Q33”. It was also commented that the “Q33” was a reference to a bus route that could go to the World Trade Center or to one of the airports involved. In fact, route “Q33” goes to the airport of LaGuadia and none of the hijacked aircraft took off or was going there. Like these, there are many other legends related to the Wingdings font family although, in reality, they are only coincidences. This typography even has a club of enthusiasts (the Wingdings Club, at the University of Michigan) which intends to spread the Wingdings code language. 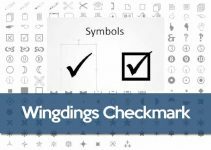 Check out the Online Wingdings Translator to convert any text to and from Wingdings font. Just enter the text in the “Arial” box and see how it automatically translates into Wingdings on the “Wingdings” box. You can also paste any text that you want to decode from Wingdings on that box and instantly see it translated into the more readable Arial font. The numbers 1 to 5 are mostly office items. 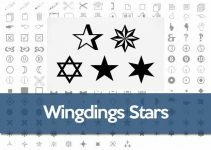 A fact not widely recognized is that the icons, symbols, arrows, asterisks, and geometric glyphs in Microsoft’s Wingdings fonts were originally designed as Lucida Icons, Arrows, and Stars, so the characters harmonize with Lucida Sans and Lucida Bright designs. Those three Lucida symbol fonts were purchased by Microsoft, who remapped the keyboard layouts and changed the names to Wingdings, but the symbols still harmonize with Lucida fonts. 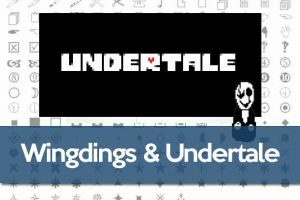 In the PC video game “Undertale“, created by Toby Fox, a character called W.D. Gaster speaks in an encrypted form using only Wingdings.